If there’s one thing you’ll find on just about any website, it’s an About Us page. Along with Contact and FAQ pages, it’s likely one of the first pages you add to your own site, and there’s a good reason for that: your audience wants to know who you are, and the About Us page is your opportunity to do just that. Your About Us page should be engaging and informative, as this helps to support the business goals you have for your website. Yet there are plenty of About Us pages out there that are bland, lackluster, or just plain old boring. Pages that lull your audience to sleep aren’t exactly helping you establish a reputation as a dynamic and interesting brand! It’s time to kick things up a notch. 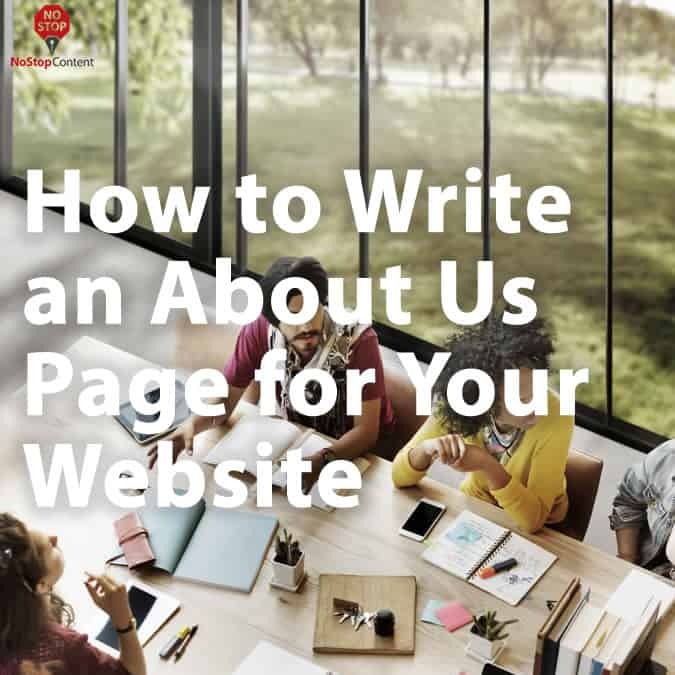 Here’s a crash course in writing an About Us page that grabs the attention of your audience and leaves them wanting more. You need to have the right approach to your About Us page in mind if you want it to have an effective impact on readers. Your approach to such a page needs to be goal-oriented: you want your audience to leave the page feeling that they have learned more about you and your business. You also want them inspired to become more involved as motivated buyers. To accomplish this, you will need to strike a balance between selling yourself to potential customers while also using a self-focused approach. Achieving both of these goals within a single About Us page can be a challenge. It’s certainly almost always easier said than done, considering that these two core philosophies are usually on either end of the scale. It’s not an impossible task, though. In fact, one of the most effective methods to achieve this balanced approach is to begin your About Us page by focusing on your audience and the challenges they face. Then, you can begin discussing how you and your company are prepared to provide solutions. Prospective customers come to your website because they suspect you have a solution to one of their problems. Designing your About Us page to reflect just that very fact shows that your visitors have come to the right place. Reinforcing the concept that your company is literally in the business of solving those problems is what turns the prospects in your audience into paying customers, and hopefully ones that will remain that way for life. Use examples of how your company founders struggled with these very same problems and sought to overcome them personally before deciding to provide solutions to others. Outline processes your company has adopted to achieve those goals, and incorporate metrics and statistics to measure your company’s success. All of this sends the message that you have the solutions your audience needs and that they have come to the right place. Telling your story through the lens of providing solutions to the problems your audience faces is important. However, it’s also crucial to present this in a way that is engaging as much as it is informative. Attention spans can be short, and if a visitor’s interest isn’t captured and kept, there’s a chance they might look for answers elsewhere. To counteract this tendency, your About Us page needs to feature attractive design elements to create a multimedia experience. In this regard, a solid layout and relevant images for your page are a must. There’s more to it than that, though; you can also benefit from more interactive elements. Video content is a strong contender in this category, as you can use video to highlight a number of different aspects of your company. Perhaps the most effective of these is to record testimonials from satisfied customers, as this shows your audience that you can deliver on your promises to solve their problems. You’ve introduced your company and staff. You’ve explained why they’re the best at solving your audience’s problems. You’ve even shown evidence of this in the form of attractive multimedia content. So what’s next? How do you finish off your About Us page on a strong note? The answer is to look towards the coming months and years and project your anticipated growth into the future. Showcase your company’s plans to build on their existing successes. Describe your desire to innovate new and better ways to resolve your audience’s ongoing problems. Provide glimpses into your development process and your roadmap towards future capabilities. All of this will once more reinforce with your audience that your company is dedicated to finding ever more useful solutions. Finally, to cap off your entire About Us page, ensure that you have a call to action (CTA) at the end. Your readers visited your page to see if your company has what it takes to provide them with solutions. By the time they get to the bottom of your page, they should be primed and ready to turn to you for that help. The CTA is essential. Having one waiting for a prospect at that point can be the catalyst in converting them from a visitor to a customer. Remember, your About Us page is an opportunity to sell your company to your audience. Having a call to action at the end provides prospects ability for prospects to contact you directly — and that’s the goal of every About Us page. Designing an effective About Us page for your website is no easy task. It requires careful thought about what you want to say and how you want to say it. That’s why focusing on your audience and providing solutions to their problems is an effective approach. Using metrics, testimonials, and targeted video content will reinforce this approach. Remember, the page is as much about your company as it is about what your company can do for your audience!